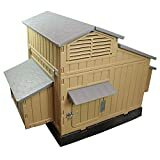 If you've always wanted to raise backyard chickens for free fresh eggs every morning, to control insect pests, help fertilize the garden, and/or to just have a unique fun pet that you will never be able to catch (great exercise though), then check out this cool new Snap Lock Chicken Coop. 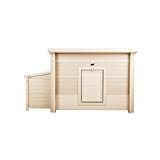 No tools are needed to quickly snap this durable, maintenance-free chicken coop together. 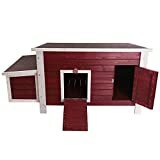 This upscale outdoor chicken coop features spacious, well-ventilated accommodations inside for up to 12 average sized chickens and has 4 nesting spots with dividers, 3 roosts, a removable litter tray, latched access points, and easy access for egg collection and cleaning. Check out this video to see it in action. Maintenance Free - Removable litter tray, large adjustable ventilation, easy access for egg collection.